A new artist in residency program in Florida public schools unites three organizations in one singular mission – to bring opportunities for creative expression to students with disabilities. Two of these organizations were already collaborating to bring art-making activities to students with disabilities in Florida public schools. Project 10: Transition Education Network is using the ArtThread Foundation’s “Work of Art” program as a way to foster creative expression, teach technology and graphics, build community and connections, and offer positive therapeutic activity to help counteract negative behavior - all leading to student empowerment and a sense of accomplishment. Now artists from VSA arts of Florida are participating in the Work of Art program, and working directly with students to introduce them to the art-making and social networking tools of the ArtThread Interactive Online Gallery. Twelve VSA artists are in residencies in schools throughout Florida, and they are working in conjunction with regional representatives from both VSA and Project 10. The artists participated in a series of “Work of Art” training sessions presented by ArtThread faculty so they could become proficient in using the features of the Interactive Online Gallery, and Splash, the integrated art-making tool. Artists in each residency use the training program and curriculum map provided by VSA and ArtThread, and are documenting the students’ progress as they acquire a variety of skills using the Interactive Gallery. These skills can be applied to many aspects of their personal and work life, giving them the foundation for life-long learning in the creative and technical arts. ArtThread provides continuing training and technical support for the residencies, as well as both written and video training support materials for the students and artists. This training and residency project is funded by Project 10, and the students’ work can be seen on the Project 10/ArtThread Gallery at Project10.ArtThread.org. Project 10's mission is to assist Florida school districts in building capacity to provide secondary transition services to students with disabilities in order to improve their academic success and post-school outcomes. Project 10 is funded by the University of South Florida, St. Petersburg, through a grant by the Bureau of Exceptional Education and Student Services, Florida Department of Education. The ArtThread Foundation is a 501(c)(3) organization whose mission is to make art and creative expression more available to those impacted by illness, physical limitations, or social consequence. With the ArtThread Interactive Online Gallery the Foundation provides a healthy way for people to have art-to-art conversations all around the world, allowing people to feel better by creating community through the power of creative expression. The “Work of Art” program is an example of how ArtThread shares its technology assets with other non-profit organizations whose mission is to support arts in healthcare, community-building, and people in crisis or those with special needs. To learn more about Project 10 visit www.Project10.info. To learn more about VSA arts of Florida, visit www.vsafl.org. For more information on the ArtThread Foundation and to see the Interactive Online Gallery, visit www.ArtThread.org. We are proud that the national office of VSA arts chose ArtThread to receive the 2009 Outstanding Community Partner Award. This honor comes from our work with the VSA arts of Florida VSAFL), one of the most effective VSA affiliates in the country. Together we created the Work of Art program, a hands-on training program that teaches technical and entrepreneurial skills to artists with disabilities. We have to thank Marian Winters, Executive Director of VSAFL, for recommending us and for being such a great partner to work with. "ArtThread truly made the Work of Art program come alive, and we are so glad that we created this partnership with them," said Winters. 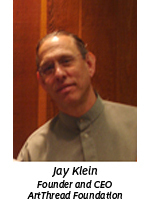 "Everyone at VSAFL helped to make the Work of Art program a wonderful success," said Jay Klein, ArtThread's CEO. Artists have uploaded over 600 pieces of art to the VSAFL/ArtThread Interactive Online Gallery. A new kind of gala evening is coming to the Tampa Bay area, and it provides an opportunity for participants to tap into their creative side and share that with the community, all while supporting a good cause. Presented by Rotary of New Tampa and the ArtThread Foundation, “mARTinis, fellowship, and fun: an interactive evening of food, drink, and creativity” features the innovative art-making activities provided by the ArtThread Foundation’s online technology. Everyone will get a chance to explore the Picasso within them as they use “SPLASH!,” ArtThread’s engaging online art-making software. 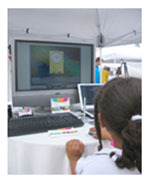 The event features several ArtThread Creativity Stations, which include large screens showing the art being made. The art will then be posted on the New Tampa Rotary/ArtThread Online Gallery. This allows everyone at the event to immediately see the art, and respond to it by posting their own art – in essence an art-to-art conversation. “Come and find out if you are the next Van Gogh, and you’ll share fellowship with friends while seeing how art becomes a means of unity and support for your community as it is shared with everyone on the New Tampa Rotary/ArtThread Online Gallery,” said Wallace. As an added bonus artists from VSA arts of Florida are donating art for this evening’s silent art auction. This will be a chance to acquire the work of these up and coming artists and to support VSA’s and ArtThread’s work with artists with disabilities. Proceeds from the auction will put VSA artists in healthcare settings in the Tampa Bay area where they can provide mentorship and be role models for children facing similar challenges. Around the corner or across the ocean, ArtThread technology nurtures creative expression and helps any organization perform their mission better by building connection, creativity, and community,” said Klein. For more information and to purchase tickets, contact New Tampa Rotary at 813-765-0707, or the ArtThread Foundation at 813-300-4114. Learn more about the event and purchase tickets online at www.martinis-fellowship-fun.eventbrite.com. For more information on the work of Rotary of New Tampa, visit www.newtamparotary.org. For more information on VSA arts of Florida, visit www.vsafl.org. The ArtThread team is brimming with enthusiasm and pride to announce a partnership with The Creative Center. The Creative Center is a community of artists, cancer patients and survivors, trustees, donors, and friends who are dedicated to bringing arts and creativity to healthcare . Through offering free-of-charge workshops in their office and workshop space in New York City, and through a bedside art program in hospitals and hospices throughout the New York area, The Creative Center brings the world of art to more than 15,000 participants each year. Their custom Gallery is up and running - visit it and see some of the amazing art done by their community. The ArtThread Foundation and VSA arts of Florida have been awarded a prestigious grant from The Able Trust, also known as Florida Governor’s Alliance for the Employment of Citizens with Disabilities, to create an innovative program designed to help artists with disabilities in the greater Tampa Bay area achieve success as working artists. The “Work of Art” program will be a full-day training session where artists will receive hands-on training in the technical and entrepreneurial skills needed to sustain a career as an independent artist. Many artists are not exposed to occupational training that provides online and computer-based art-making and art distribution skills, and these are crucial for the developing artist to achieve entrepreneurial self-reliance. The “Work of Art” program will provide a starting place – a way for the artist to take specific steps towards overcoming the challenges caused by physical and fiscal logistics. The ArtThread Foundation is a 501(c)(3) public charity whose mission is to make art and creative expression more available to those impacted by illness, physical limitations, or social consequence. With the ArtThread Interactive Online Gallery the Foundation provides a healthy way for people to have art-to-art conversations all around the world, allowing people to feel better by creating community through the power of creative expression. VSA arts of Florida is dedicated to creating a society where people with disabilities can learn through, participate in, and enjoy the arts. VSA arts of Florida provides arts, education, and cultural opportunities for and by individuals, and believes all individuals with disabilities who aspire to careers in the arts should have the opportunity to develop appropriate skills. The “Work of Art” training program will be scheduled in autumn of this year. ArtThread will provide technical support after the training, as well as a handbook containing the complete training presentation. A marketing campaign to promote the VSA arts of Florida artists’ work will be implemented, and artists will have an opportunity for creative participation in the campaign. The Able Trust, also known as the Governor’s Alliance for Employment of Citizens With Disabilities, is a 501(c)(3) public-private partnership established by the Florida legislature in 1990. Its mission is to be the leader in providing Floridians with disabilities fair employment opportunities through fundraising, grant programs, public awareness, and education. Since its establishment The Able Trust has awarded over $22 million to individuals with disabilities and nonprofit agencies throughout Florida for employment related purposes. Its programs enable over 2000 Florida citizens with disabilities to enter the workforce each year. Sarasota, FL – There's nothing like the look on a child's face as they become totally engrossed in making something they can call their own. Those looks, along with plenty of "ooohs" and "aaahs", were plentiful in The Wellness Community of Southwest Florida's booth at the "Giving Hunger The Blues" event in Sarasota last Sunday. The ArtThread Foundation displayed its Interactive Online Gallery as part of The Wellness Community's cancer support offerings. Both children and adults were mesmerized by ArtThread's online art-making program SPLASH!, a web-based painting program that includes tools that can make anyone feel like an artist. Once someone's masterpiece is ready, it can easily be saved and displayed on the ArtThread Online Gallery, and this is where the connections begin. People can use the Gallery to have an art-to-art conversation, adding their own creative expression to a particular conversation – an "art thread." "It was a real treat to watch the kids' faces as they began to use the varied brushes and colors available with SPLASH!" said Rob Rothschild, President of the ArtThread Foundation. "They were thrilled to get a chance to be creative, and to do something in support of kids with cancer." Art made by people at the "Giving Hunger the Blues" event was saved and placed in a Wellness Community "thread" on the ArtThread web site, and all the artists were invited to view their work and continue to connect with each other via their art. 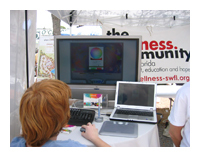 "We are all about giving kids with cancer a chance to express themselves creatively, and adding the ArtThread Online Gallery to our offerings is a great way to create an art-based community for cancer survivors," said Jay Lockaby, Executive Director of the Wellness Community of Southwest Florida. Both children and adults served by The Wellness Community can get involved with this online art conversation. "Think of the ArtThread Gallery as an infinite canvas of thousands of interconnected pieces of artwork that represent the healing journey," said Jay Klein, CEO and Founder of ArtThread. "Survivors need creative expression, and we are thrilled and honored to be helping The Wellness Community with their mission to support survivors." 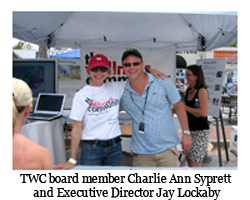 The Wellness Community is a national organization with local affiliates. There are 22 Wellness Communities across the United States and two international affiliates, in Tokyo, Japan and Tel Aviv, Israel. For more than a decade, The Wellness Community in Sarasota, Florida has served thousands of people affected with cancer, as well as their families and caregivers, with free support services. Starting with a simple question - How can we serve more people and how can we serve them better? – The Wellness Community vision became "Building Hope," a campaign for a destination health-care facility that will serve more than 5000 people a year and feature numerous healthful advantages amidst an inspired combination of art, design, gardens and technology. The new LEED-Gold designed facility, planned for construction on a pastoral 5 acre setting in Lakewood Ranch, is expected to become a model for The Wellness Community facilities worldwide. For more information visit www.wellness-swfl.org. The Wellness Community was one of the organizations benefiting from the "Giving Hunger the Blues" charity event. Its mandate is to provide those less fortunate with the most basic of needs -- food. An all-day event, featuring local musicians, restaurants, children's games and family entertainment, "Giving Hunger The Blues" has become one of the most anticipated events of the year in Sarasota, attracting in excess of 5000 people committed to fighting hunger and protecting children. For more information visit www.givinghungertheblues.org. The statement "I can't draw" may be a thing of the past once The ArtThread Foundation's new interactive gallery is launched. A key element of this art-based online gathering place is the set of art-making tools being created by the Entertainment Technology Center (ETC) of Carnegie Mellon University. The ArtThread Foundation's mission is to improve the quality of life for cancer survivors using the power of creative expression, and the online, interactive ArtThread Gallery will serve as a place to connect with other survivors as well as a place to create and share art. "The Gallery will offer a chance for people to share their art, and, perhaps even more importantly, to have fun making art on the Internet," says Rob Rothschild, president of the ArtThread Foundation. "Think of it as social networking with paint brushes, and those brushes are being created by the amazingly innovative and imaginative team at the ETC." "The Gallery is a space where traditional forms of creative expression such as painting, music, and photography are transformed into a "message in a bottle" – a signal connecting the entire family of ArtThread survivors," says Jay Klein, founder and CEO of the ArtThread Foundation, and a cancer survivor. "We know that creative expression can be a vital part of the healing process as patients and their families move from diagnosis, treatment, and survivorship. I've experienced that magic myself, and the Gallery will be a way for everyone to express themselves." The ETC team includes Fred Gallart, Phil Light, and Patrick Mittereder, and their collective expertise ranges from game-making to software design to graphic design to fine art. "We are creating an interface that removes the traditional barriers that prevent people from tapping into their own creativity. And it's great to be involved with the ArtThread mission," says Gallart. 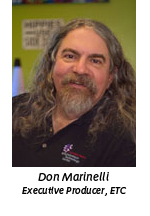 "ArtThread's work is a good fit for our program," says Don Marinelli, executive director of the ETC. "Our students are applying their prodigious talents to a project that serves the greater good and gives them a unique perspective on the value of creative expression." "Our partnership with the ETC is giving us the opportunity to fulfill a key part of our mission," says Klein. "Creative expression is crucial for everyone touched by cancer, and these online games will allow kids and adults to step back and say –I made that!'" The Entertainment Technology Center of Carnegie Mellon University is one of the world's leading institutions for training in interactive digital media. Students undergo a rigorous, project-based curriculum where they work in teams in highly creative environments. The ETC currently has its headquarters in Pittsburgh, and other operational campuses in Adelaide, Australia as well as Redwood City, California. Soon, campuses will be available in Seoul, Korea and Singapore. Students are encouraged to travel to these and other sites all over the world to expand the scope of their projects. Many adventurous projects lead to start-up companies or starting points for Ph.D. research. The ETC offers the world's only master of entertainment technology (MET) degree, a unique program that combines fine arts with technology to enable students to learn the processes, resources and insight for storytelling and entertainment in a digital medium. The ArtThread Foundation is a non-profit foundation whose goal is to strengthen the survivorship community using the power of the universal language of art. The online Gallery will provide a way to answer the emotional, psychological, and spiritual challenges of the cancer journey so survivors can continue on their optimal healing path. For more information about the ETC visit www.etc.cmu.edu.